In episode #84 of Troublesome Radio, I talk about my recent Twitter threads that got quite a bit of attention. I've now come up with criteria every man should DEMAND from a girl before committing to anything. 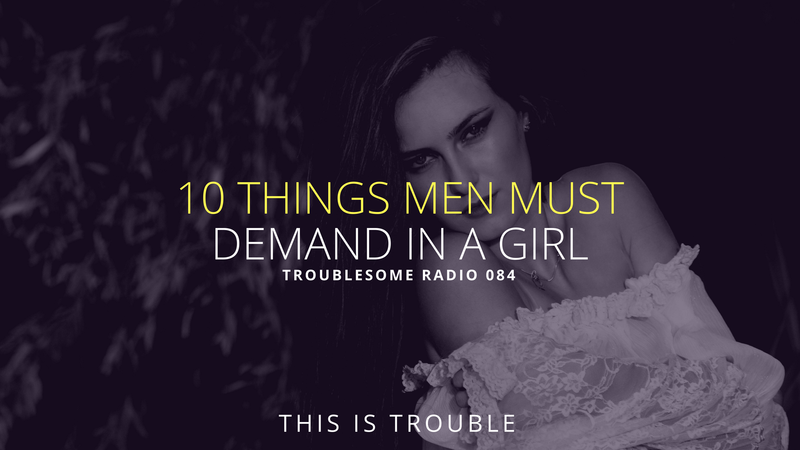 The women who are truly feminine, looking to improve, and wanting to find the best man they can. If you are a girl who likes the idea of a career, loves cats, or is fat or generally unpleasant—you’ll hate this show. Don't listen (even though I know you will anyway). As for the other five - you'll have to listen to find out! It's also worth noting that I did write a nearly 2,000 word post on the same issue. This podcast was much more of a very epic rant. PSS: If you like Troublesome Radio, you're in for a damn treat. This summer, I'll be launching the Nomad, Nerdy, and Dirty Show. The premium video podcast series regarding everything nomadic life and online business. Click here to get on the wait list.